The 2013 version of the Nexus 7 (Nexus 7.2) Android tablet has many advantages over its predecessor. It’s thinner, more powerful, has longer battery life, etc. One thing I’ve come to love about it is support for the Qi wireless inductive power standard, which allows you to charge devices without plugging them in. We have several devices in the house with damaged / worn microUSB ports from repeatedly plugging cables in. I have to use a specific cable to charge my old HTC Droid Incredible because that specific cable has a slightly larger jack. A device that’s Qi-capable. The Samsung Galaxy S4, Nexus 4 and Nexus 7 2013 support Qi out of the box. You can buy adapters for popular Samsung phones such as the Galaxy S3 and some iPhones. Unfortunately our Galaxy Nexus phones are not Qi-capable, and there are no aftermarket parts for it. An inductive charging mat that supports the Qi standard. There are a ton of companies making these, ranging from Samsung to Energizer to companies I’ve never heard of like Anker and LuguLake. You’ll need a microUSB charging cord. Some mats come with their own cords, but you probably have one or more of these lying around. A wall-to-USB power converter. You might be able to bundle the last two things together. Some mats come with their own converter, some don’t. Samsung had a sale on their Qi charging mat — half off, for $25 before shipping. You can buy other Qi mats for about the same price, but those are made by companies I didn’t recognize. I knew the Samsung Galaxy pad didn’t have a power source or include a microUSB cable, but I figured I had plenty around the house. The charging pad is about the size of my hand. I wear a size 9 glove in Euro sizes if that helps anyone with scale. The pad was originally built for the Nexus 4 phone, so the Nexus 7 2013 overhangs the device. Some pads allow you to charge more one device at once, so keep that in mind if you own more than one Qi-compatible whizbang. There’s a three-stage LED on the top of the unit. The LED will flash red, yellow, and green when you first plug it in. The light will glow green if it is charging a device. The light will turn yellow if your power source isn’t providing enough power to the unit. 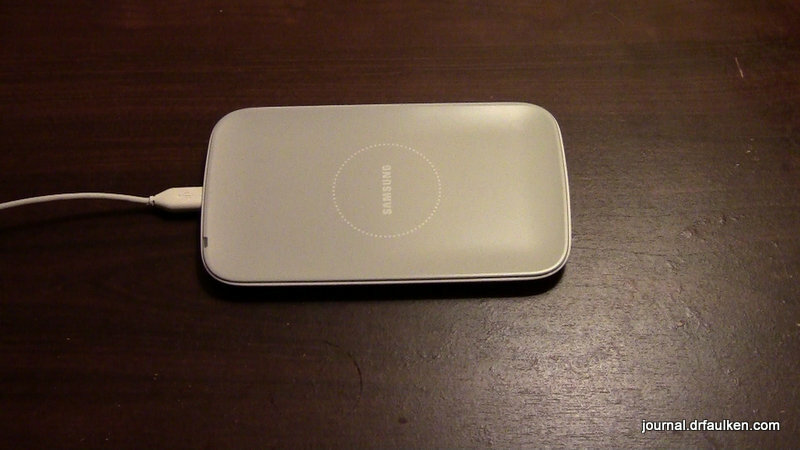 The Galaxy charging pad requires at least 2 amps of charging power according to the manual. People on XDA Developers report getting by with less. I wound up using the extremely loud 2.1 Amp charger from AmazonBasics, but I had hoped to get by without buying it. I had read that the charging coil on the pad has to be lined up perfectly with the receiver. I placed my Nexus 7.2 directly on the center of the unit and waited for the magic to happen. I scooted the Nexus 7.2 around on the pad, but no love. I tried four different USB power sources. Nothing. I bought the 2.1 amp charger from Amazon. Two days later the charger arrived. I kissed Sedagive? hello, bounded upstairs, and plugged it in. Back to XDA Developers I went, and I found that some Nexus 7 2013 owners had problems with Qi charging. A few brave souls opened their 2013 models up and found a ton of residue on the Qi receiver area. They cleaned this area up, snapped the case together and everything worked. I wasn’t willing to take this chance, especially after reading widespread reports of people cracking the backs of their cases when attempting the repair. I ordered a replacement from Amazon and waited another two days. Two days later my new Nexus 7.2 arrived. I kissed Sedagive? hello, bounded upstairs, and set the tablet down on the pad. I’ll save the saga of transferring all my crap from my defective Nexus 7 2013 to my new one, but the Samsung Galaxy Qi charging pad is really awesome. I had to endure some difficulties to get to this point, but I really like being able to charge my tablet just by setting it down. If I had to do it all over again, I’d get a different charger. The total cost of the Samsung Galaxy charger was about $45, accounting for shipping and the USB power adapter from Amazon. I’d try the Energizer one or one of the generic / no name chargers. The Samsung Galaxy Qi charging pad is recommended, but I might give a stronger recommendation to find another product at about the same overall price.